John Michell, one of audio’s best known and most respected audio engineers, designed this versatile, precision-engineered, geometrically correct counterweight system, suitable for all Rega arms and their various derivatives. This all stainless steel device will fit the Rega RB100/101/202/250/300/301/303/600/700/900/1000 arms and their variants such as Moth, Audio Note, Goldring, and Origin Live OL-1 arms. (Will NOT fit any other OL arms). The TecnoWeight will handle a wide range of cartridges, with weights from 3g to 13g. This versatility is achieved by supplying two different counterweights for cartridges in the 3-6g and 6-13g ranges. (For heavier cartridges Like the ZU, you will also need to purchase the Extra Heavy Counterweight below). 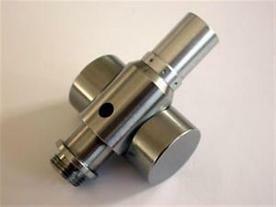 The chosen counterweight is fitted to a slider bush that travels on a new, stainless steel stub shaft. An aluminum vernier knob that screws onto the rear of the stub shaft allows precise, calibrated adjustment of tracking weight in increments of one tenth of a gram. The Counterweight itself is underslung below the main axis of the arm tube to bring the centre of gravity of the whole arm tube assembly in line with the stylus tip. The TecnoWeight’s precision engineering and fine adjustment capability provides a significant sound improvement. The replacement of the plastic stub shaft and large diameter counterweight, allow for much more control, precision and detail in musical reproduction. When used with RB300/301/303/600 arms, the TecnoWeight dispenses with the need to use the arm’s own somewhat questionable tracking force system, which further improves sound reproduction. The TecnoWeight is standard on Michell’s flagship TecnoArm.